The Westbrook Municipal Parking Lot was located on Main Street opposite Central Street, which once connected to Main Street. The parking lot bordered the Presumpscot River, and the Public Works Department had a snow dump at the rear of the lot to dump snow into the river. This lot served the downtown merchants for many years. Urban Renewal took the property and developed it into Saccarappa Park, the Bridge Street Traffic Spur and a small parking area. The building shown here is the Dana Warp Mill which is located across the river on Bridge Street. To see more historical photos and artifacts, visit the Westbrook Historical Society at the Fred C. Wescott Building, 426 Bridge St. It is open Tuesdays and Saturdays, 9 a.m.-noon, and the first Wednesday of each month at 1:30 p.m., September-June. Inquiries can be emailed to westhistorical@myfairpoint.net. The website is www.westbrookhistoricalsociety.org. 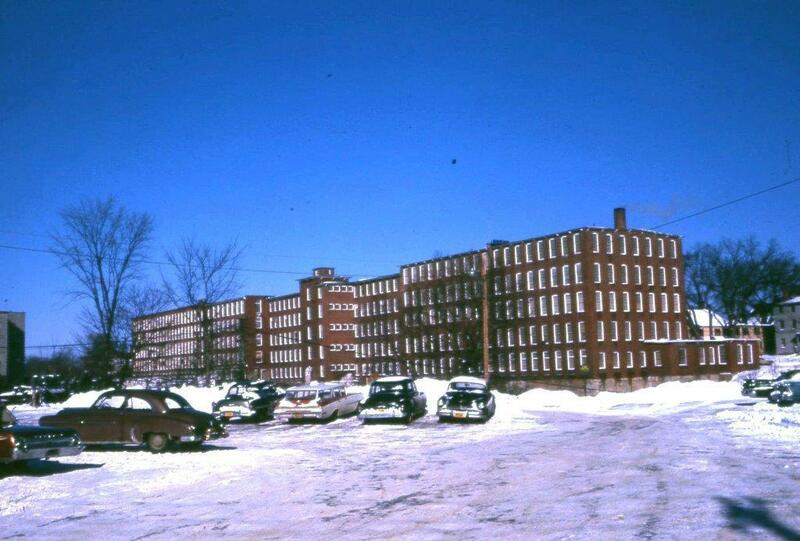 The former Westbrook Spinning Mill, operating since January as the Westbrook Worsted and Woolen Corp., closed its doors March 13, leaving around 60 people without jobs. It may have closed for good, but there’s some hope it will be sold and re-opened. “I’m not going to stand in the way of anybody continuing that mill. I’ve been offering it for peanuts so that the people who worked there could continue the have jobs,” owner J.P. Waldthausen said Monday. He bought the business from bankruptcy court three months ago. Former owner Donald Spencer has continued running the mill for Waldthausen. Scott Paper Co. is preparing to cut its workforce by offering early retirement bonuses in several departments of the S.D. Warren mill in Westbrook. It is expected to announce March 26 how many jobs will be cut. Sources said Scott has asked all five of the unions to offer the names of people who would be willing to retire early. Nancy and Bruce Perkins, White Rock Road, Gorham, have kept various small farm animals for years. Last year they decided to raise rabbits again. Not wanting to be overrun, they acquired what they though were two make rabbits and put them in a hutch together. On Monday, they found out how wrong their assumptions can be. One of their two “boy” rabbits had given birth in the underground burrow, and at least two young white bunnies, all furred out, have been popping out into the light of day. As many residents can verify, pheasants now thrive in the Gorham-Windham area. Growth of the pheasant population is the result of dedicated work by members of the Windham-Gorham Road and Gun Club. It has handled most of the raising and releasing of thousand of the birds for about a decade. David McPhee, chairman of the club’s Pheasant Committee for two years, reports that 32 members work on the program. State funding for feed or the cost of the chicks has been reduced to nothing. That situation only produced more resolve in the club, which now buys, raises, feeds and releases the game birds with its own funds. Walking the halls of Westbrook High School are four newly crowned state champions. Amanda Wood, a junior, in her first season of indoor track, took the state 300-yard title in 38.27 seconds. Miriam Johnson, a junior, placed first in the 100-yard butterfly in the state swimming meet at Bowdoin College. Brian Walch, a senior, won the state wrestling championship in the 160-pound class. Fred Stuart, a sophomore, won two state swimming championships, the 100-yard freestyle and the 100-yard backstroke, in the state meet in Orono. Councilor Calvin Hamblen was unanimously elected chairman of the Gorham Town Council at a special meeting March 17. He replaces Councilor John Emerson. If cats have nine lives, one lucky Persian being called ET at the Animal Refuge League in Westbrook has already used eight. Westbrook Animal Control Officer Carolyn Ross found the male cat running loose around Riverview Terrace in Westbrook on March 18. “This cat was in very severe shape,” Ross said. “He was skin and bones. His jaw had been broken and never set. His tail was broken. His hair had matted to the point where we had to shave it all off.” But ET will make it. And he’s become a favorite among the shelter’s staff. More than one person has already volunteered to adopt ET if no owner comes forward. Robert Crowley’s technical physics class at Gorham High School is studying the math and physics involved in a medieval-style catapult. Instead of hurling heavy stones to break down castle walls, they’ll perhaps hurl snowballs. The catapult is 12 feet high and weighs 800 pounds. It was given to Crowley by a friend. It was used by a Falmouth physics class to hurl pumpkins. Crowley, assisted by students, hauled the catapult to Gorham on a trailer and set it up near the high school baseball field. An all-hands alarm went out to Westbrook’s fire crews just after 5 a.m. Saturday when Sappi workers discovered fire deep down inside the pile of wood chips stored in the big covered shed off Park Road. The fire, never big, continued deep in the pile Monday as crews from R.J. Grondin Excavating worked to move all the chips out of the building. Gorham Historical Society members will take “foods of the 1800s” and “foods like grandma used to make” to be shared at their meeting April 8. They’re asked also to have a copy or copies of the recipe they use. Optionally, members will wear period costumes, and Darrell Morrill is arranging for period music. Three Westbrook boys, all juniors in Westbrook High School, have been in Stockholm, Sweden, this month with a Maine hockey team to play teams from Sweden, Finland and Germany. They are David Celeste, son of Anthony and Maryann Celesta, 19 Alberta Drive; Joey Morse, son of Roger and Carol Morse, 54 Waltham St.; and Dominic Reali, son of Carol Reali, Anne Terrace. Westbrook’s School Committee got a package of work Wednesday, the budget for the year beginning July 1. It’s $24,111,337 – up from this year by 4.36 percent, and increase of $1,007,853. Salaries and health benefits account for most of the $1 million increase, said Superintendent Stan Sawyer. The committee is now going though the budget’s various accounts.